Cashew nuts can be part of a nutritious post-workout meal or snack that maximizes your energy levels and muscle synthesis. Keep them in your gym bag or locker so that they are readily available shortly after you finish exercising, and eat them with other healthy foods. Adjust your post-workout snack so that it is consistent with your needs, whether you are an elite athlete or casual exerciser. Eat a small snack within 30 minutes of finishing your workout for maximum benefits. Your body uses carbohydrates in your diet to maintain normal blood sugar levels and stores extra carbohydrates as glycogen for later use. Protein is necessary to repair muscles and increase muscle mass. 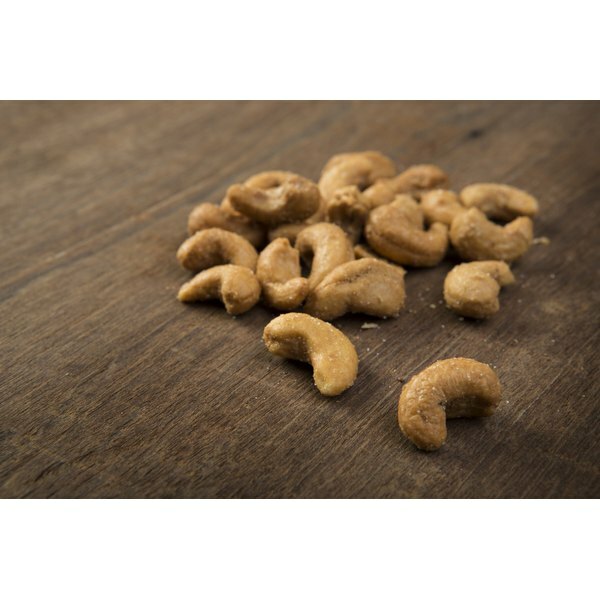 An ounce of cashew nuts provides 9 grams of carbohydrates and 4 grams of protein. Cashews are naturally low-sodium, with 5 milligrams per ounce of unsalted roasted nuts. Low-sodium foods are usually the healthiest options because a high-sodium diet can lead to high blood pressure -- but you may need extra sodium after a hard workout if you are a heavy sweater. Consuming sodium with your post-workout meal can help you rehydrate by increasing water retention and making you thirsty. An ounce of roasted, salted cashews provides 181 milligrams of sodium. Healthy adults should have no more than 2,300 milligrams of sodium per day. Potassium is an electrolyte that helps regulate water balance in the body. It is an essential mineral in the diet, and healthy adults should consume at least 4,700 milligrams of potassium per day. Individuals who exercise intensely for more than an hour may need extra potassium to prevent muscles from cramping during exercise. An ounce of cashew nuts provides 160 milligrams of potassium, and a dried fruit and cashew snack is a convenient way to increase your potassium consumption after a workout. A post-workout meal that provides several hundred calories, including 100 to 200 grams of carbohydrates, is most appropriate for athletes in intense training. Average exercisers may perform short workouts at a low intensity, such as walking at a moderate pace for 20 minutes. You do not need a high-calorie post-workout meal to refuel your body after this type of workout, especially if you are trying to lose weight. An ounce of cashews can provide sufficient energy and nutrients to tide you over until your next meal. What Nutrient Does Your Body Need Most After an Intense Workout ?